At 6:58 am on December 26, 2004, one of the most powerful earthquakes ever recorded began shaking the Pacific seafloor about 150 miles off the west coast of the Indonesian island of Sumatra. Within moments, the magnitude 9.0 quake gave birth to a tsunami — a wall of fast-moving water that is one of the most feared of all natural disasters. The word tsunami comes from two Japanese words: tsu, which means harbor, and nami, which means wave. In English, tsunamis are often called tidal waves, but they have nothing to do with the tide. As NATURE’s Violent Hawaii shows, tsumanis are formed when an earthquake, landslide, or even the impact of a meteorite displaces huge amounts of water, sending it rolling at speeds of more than 500 miles per hour across the open ocean. As the tsunami travels into shallower water, near coasts, it slows down and the sloping seafloor pushes the waves upward — resulting in waves that can be several hundred feet high. The powerful flood waters can wash far inland, sweeping everything in their path back out to sea. The effects can be devastating, as the Indian Ocean tsunami showed. Within hours of the initial earthquake, shorelines thousands of miles away were pummeled by waves as high as 30 feet. Fishermen, tourists, and coastal residents in Indonesia, Sri Lanka, India, Thailand, the Maldives, and even as far away as Somalia had little inkling of what was coming due to the speed of the wave and, more importantly, the lack of a tsunami warning system in the Indian Ocean. At last count, more than 155,000 people have been killed and more than 1.7 million displaced in what is being called one of the worst natural disasters of the last 100 years. 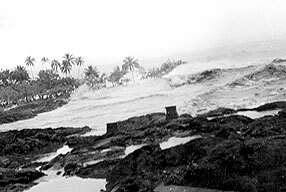 Hawaii was hit by a devastating tsunami in 1946 (shown above) and in 1960. The Indian Ocean tsunami has also served to remind us of past tsunamis. In Alaska and Hawaii, people recalled the 9.2 trembler that hit Alaska’s Prince William Sound in 1964, sending a powerful tsunami barreling across the North Pacific. More than 100 people were killed in Alaska, California, and Oregon. In 1960, a giant quake struck near Chile, hurling tsunami swells of up to 75 feet high against the country’s coastline. The floodwaters penetrated more than a quarter-of-a-mile inland and at least 200 people died. But the worst wasn’t over. 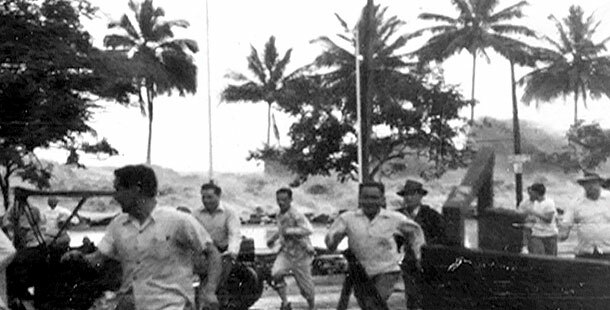 The tsunami raced outward from the quake site, crossing the Pacific at jetliner speeds. Six thousand miles away in Hawaii, officials began to broadcast warnings that the tsunami was due around midnight. It struck hardest at Hilo, where a 35-foot wall of water snuffed out a power plant and swept away more than 60 people. Overall, up to 3,000 people died along the Pacific Rim that day. Prior to the Indian Ocean tsunami, the most recent devastating tsunami struck Papua New Guinea on July 17, 1998. Sparked by a magnitude 7.1 earthquake that struck off the coast, it sent 30-foot waves crashing into seaside villages, killing more than 2,000 people. Papua New Guinea, like Indonesia, is within the “Ring of Fire,” an area in the Pacific Ocean where earthquakes are almost a daily occurrence. Today, partly as a result of these historic disasters, some nations have established a tsunami warning system monitoring the Pacific Ocean. It is activated within moments of a potentially dangerous earthquake or landslide. Several countries affected by the 2004 tsunami are now working on a system for the Indian Ocean. Although the Pacific Ocean warning system has saved many lives, tsunamis remain difficult to predict, in part because the seafloor’s topography can steer them in surprising ways. Tsunamis are one of nature’s least predictable and most dangerous events.